Change the icon of WordPress menu and submenu items. - Fixed: bug when searching icons. 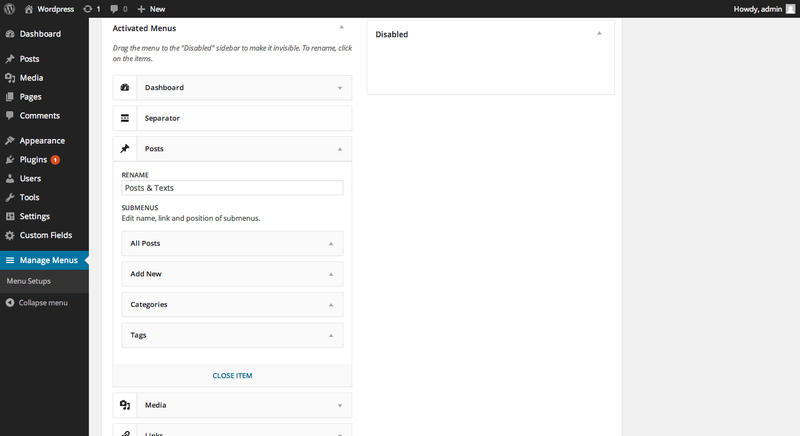 - Fixed: Now you can apply a setup to a role and overwrite that with a setup to a specific user. - White label styles bug fixed. - Removed SASS class that was conflicting with some popular themes. - Visual Composer Frontend editor compatibility issue resolved. - REMOVED ADVANCED CUSTOM FIELDS COMPLETELY (ACF is no longer a dependency and is not included). - Bug in creating Multiple Menu Setups fixed. Version 3.0.4 - IMPORTANT RELEASE, PLEASE UPDATE! - MAJOR BUG FIX: Menu Setups now apply to roles correctly. - MAJOR BUG FIX: Separators do not "pop up" after updating Menu Setups. - Ultimate Add-ons and other plugin conflicts solved. - Fatal Error in menu creation solved. - New: Support to menu items that have image icons in the WPAMM interface. - WPAMM Menu only displayed to admins. - "Close Item" button now works again. - Bugfix in the Widgets admin section, scripts conflicting solved. - iconPicker bug fixed on comments and plugins menu items. - Ability to create and exclude separators **(NEW)**. - Compatibility issue with iconmoon. - New ACF Version (5.2.0) added, solving update alert bug for good now. - New ACF version (5.1.8) added, solving the update alert bug. - The next update was not really the version 2.1.1 due to a mistake in the release process. We are very sorry. This new update is the new version, 2.1.1. - Performance enhancement to hight traffic sites. - Deactivate menu setups temporarily (new feature). - Export single menu items (new feature). - Change menu icons (new feature). 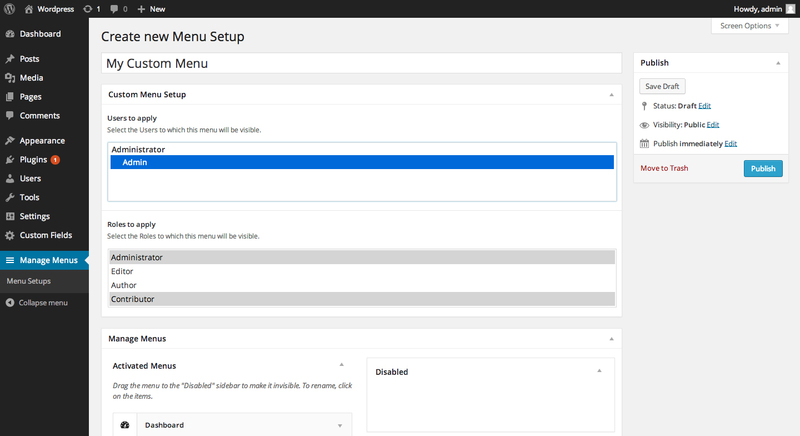 - Table now shoes relevant information about the menu setups (new feature). - Fixes on submenu support. - Label on the exporter changed from ambiguous "Menu" to "Admin custom menu". - "Keep Calm" notice hidden when whitelabeled. - Update on ACF bundled version. - ACF upgraded to version 5. - Bugs related to new plugins being installed fixed. - Conditional loading of ACF to avoid redundancies. 1.1.0 - Roles and Submenu Support as requested!